Continuing our series on screen portrayals of Pilate that I began in 2011 during Holy Week. The posts on portrayals of Pilate by Rod Steiger, Richard Boone, Barry Dennen, Hristov Shopov, Telly Savalas and Frank Thring may be read here, here, here, here here and here. Continuing our series on screen portrayals of Pilate that I began in 2011 during Holy Week. The posts on portrayals of Pilate by Rod Steiger, Richard Boone, Barry Dennen, Hristov Shopov and Telly Savalas may be read here, here, here, here and here. The late Frank Thring, an Australian actor, had the distinction of playing both Pilate and Herod Antipas in major films, Pilate in Ben Hur (1959) and Herod Antipas in King of Kings (1961). 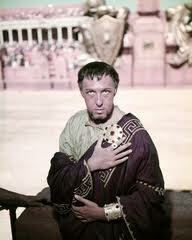 In Ben Hur we get a glimpse of the backstory of Pilate. Thring portrays Pilate as an urbane Roman aristocrat dismayed that he is being sent to govern bleak and hot Judea. At a party given by Arrius to anounce his adoption of Ben Hur, go here to view the video, Pilate indicates his dismay at the prospect. After Ben Hur wins his famous chariot race, Pilate cynically crowns Ben Hur as the “one true God” for the moment, of the people. Go here to watch the clip. Continuing our series on screen portrayals of Pilate that I began in 2011 during Holy Week. The posts on portrayals of Pilate by Rod Steiger, Richard Boone, Barry Dennen and Hristov Shopov may be read here, here, here and here. Telly Savalas in The Greatest Story Ever Told (1965) gives a fairly stolid performance as Pilate. He portrays Pilate as a world weary Roman functionary to whom Christ is merely a problem he does not need. When he transfers Christ’s case to Herod, we see Jose Ferrer who gives a strikingly good portrayal of Herod Antipas. Ferrer portrayed Herod as a man touched against his will by the words of John the Baptist. Now however he has executed John the Baptist, and has given himself up for damned, taking refuge in drink. A video on Lincoln’s office clock. It is interesting the items associated with Lincoln that have survived the century and a half that separates us from him. Lincoln of course became famous quite suddenly, and was catapaulted into immoratlity by his assassination. I think this probably aided in the preservation of items associated with him. If Lincoln had lived for a number of years after his presidency, he still would have been an extremely important figure in American history, but he would not have attained the stature that he did without his tragic and sudden death. He died in the moment of victory, his reputation unsullied by the compromises he would have had to have made in Reconstruction. I think the country would have been better off if Lincoln had lived, but not so his status as the equal of George Washington. John Cardinal Carberry was one of the men who had the unique experience of attending two Papal Conclaves within little more than a month of each other in 1978. He was born in Brooklyn, New York in 1904, the youngest of ten children. He enrolled at Cathedral College in 1915, where he displayed a love for the priesthood, playing the violin and baseball. Like many men who become Cardinals in the Church in America, he studied at the North American Pontifical College and was ordained in 1929. From 1941-1945 he served as professor of canon law at Immaculate Conception Seminary in Huntington, New York. From 1945-1956 he was Chief Judge of the diocese of Brooklyn. In 1956 he was appointed Coadjutor Bishop of Lafayette, Indiana. He succeeded as second Bishop of Lafayette in 1957. He attended all the sessions of Vatican II and was an active participant. In 1965 he was named seventh Bishop of Columbus, Ohio. At Columbus he gave active support both to the civil rights movement and ecumenicalism. In 1968 he was appointed the fifth Archbishop of Saint Louis. By this time the chaos within the Church that followed in the aftermath of Vatican II was well underway and Carberry did his best to oppose it. He celebrated Humanae Vitae and established the Archdiocesan Pro-Life Commission, giving an early impetus to the pro-life movement in Saint Louis. He opposed Communion in the hand until 1977, fearing that it was irreverent and would lead to hosts being stolen for use in Black Masses. He spoke out loudly against the sitcom Maude, one of Norman Lear’s television vehicles to preach liberalism to what he perceived as the great unwashed, which celebrated contraception and abortion. He was one of the American prelates in the vanguard against the activities of the liberal Archbishop Jean Jadot, Apostolic Delegate to the United States from 1974-1980, whose influence on the Church in America was almost entirely pernicious. I recently was watching The Red Badge of Courage, (1951) and I was struck yet again by what a forgotten masterpiece it is. Filmed in stark black and white, the film has almost a documentary feel to it, as if a World War II era newsreel camera had magically transplanted itself to the Civil War. The combat scenes are highly realistic depictions of Civil War combat, and the actors speak and act like Civil War soldiers and not like 1951 actors dressed up in Civil War costumes. As one critic said at the time, watching the film is like watching a Matthew Brady photograph of the Civil War come to life. It was a stroke of genius for director John Huston to have as star of his film Audie Murphy, as the youth who, in Stephen Crane’s unforgettable novel, has his first taste of combat in the Civil War. Murphy looked like a typical Hollywood “pretty boy” but he was anything but. From a family of 12 in Texas, Murphy had dropped out of school in the fifth grade to support his family after his father ran off. His mother died in 1941. In 1942 he enlisted in the Army at 16, lying about his birthday, partially to support his family and partially because he dreamed of a military career. By the end of the war, before his 19th birthday, he was a second lieutenant and had earned in hellish combat a Medal of Honor, a Distinguished Service Cross, two Silver Stars, a Legion of Merit, a French Legion of Honor, a French Croix de Guerre, a Belgian Croix de Guerre, two Bronze Stars and three Purple Hearts. He was the most decorated soldier of the US Army in World War 2. Most First Ladies of the United States have been content to stay in the background. A few have not. Perhaps the most overtly political of all first ladies was Eleanor Roosevelt. A fairly doctrinaire liberal, Roosevelt maintained a strenuous speaking schedule, stumping around the nation and the world for her husband’s policies. Reaction to her broke down along partisan lines, with most Democrats virtually worshiping her as a saint and most Republicans regarding her as a none too bright liberal harridan. WASHINGTON, Thursday—I wonder whether you agree with the statement I made yesterday, that we cannot overcome difficulties unless we recognize them. In talking to some Russians once, I was struck by the fact that they kept insisting that everything in their country was perfect. It seemed to me, at the time, as rather childish and adolescent, but forgiveable in a young country trying a new experiment. In us, a mature democracy, it would seem to me unforgiveable to deny the existence of unpleasant facts. A certain gentleman in Congress seems to have forgotten that groups of sharecroppers attracted the attention of the whole country not so very long ago, because they were living along the highways and their living conditions were as bad as bad could be. This gentleman thinks it odd that a group of people are willing to back a union which will try to improve conditions for these people, and that acknowledges the fact of the conditions under which sharecroppers in the United States of America have had to live in certain parts of our country. Perhaps the gentleman in question, who mentions only three people on this committee, would like to have it also recorded that there are a few others members of this committee—among them Bishop Edward L. Parsons, Governor Saltonstall of Massachusetts, Mr. Raymond Gram Swing and Mr. William Allen White. Perhaps this gentleman in Congress would like to hear the stories that some of the these sharecroppers tell, not just the poor Negroes, but some of his own white people. I hardly think he would approve of these conditions. Since they exist, I think we had better set ourselves to correcting them. That is the mature way to approach all undesirable situations. Of course, if he approves of them, then I can well understand that he does not wish to have them mentioned. Hitler’s propagandists can make far greater use of things that are wrong and which we do not try to correct, than they can when we try to improve conditions. This member of Congress is evidently not reading some of the things which the German propagandists have said about situations which have occurred in this country, at least he makes no mention of them. I am going to speak today at a War Savings Bond rally in Upper Darby, near Philadelphia, and tonight at Swarthmore College. I shall be back in Washington before the night is over.